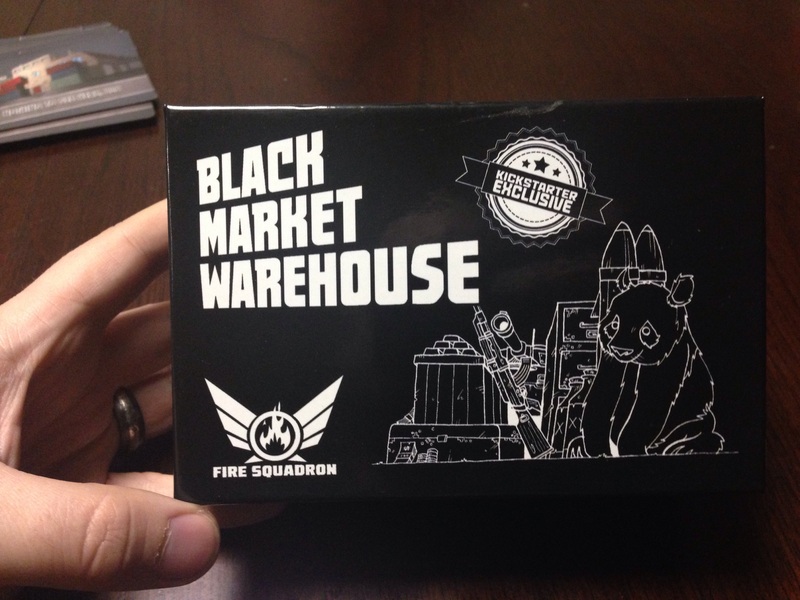 In Black Market Warehouse from Fire Squadron, you play as a warehouse manager. Sure it sounds a little boring but I assure you it’s not–the warehouses you are managing belong to the mob and it’s your job to fill them up with the various illicit goods while thwarting the competition and avoiding the cops. The goal of Black Market Warehouse is to make the most money by filling your warehouses with the most valuable items available on the black market. The rival warehouse managers can attempt to thwart you by sending various insiders your way. 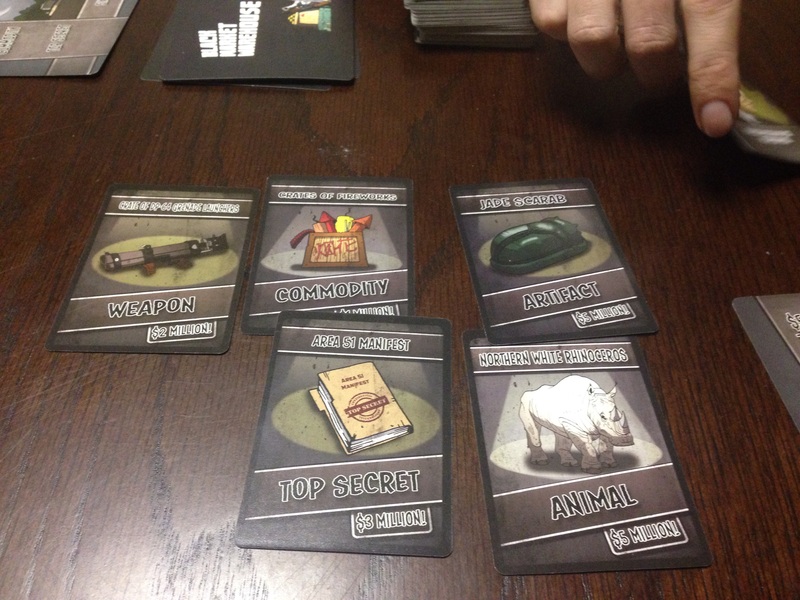 Each player starts out with a warehouse card which they are attempting to fill with the goods which they draw and keep in their hand; these warehouses all have fun names such Legitimate Business, Inc. and Keep Walking Farms. The goods all have various specific types–Top Secret, Animal, Weapon, Commodity, or Artifact and varying amounts they are worth if you end up scoring them. The goods are also various fun black market items (I am particularly fond of the Top Secret items which have fun names such as Cold Fusion Device, Worm Hole Generator, Jimmy Hoffa Witness Relocation Details, etc.). Every turn players draw a card and then can play one insider (which I will get to below) and store one good in their warehouse. 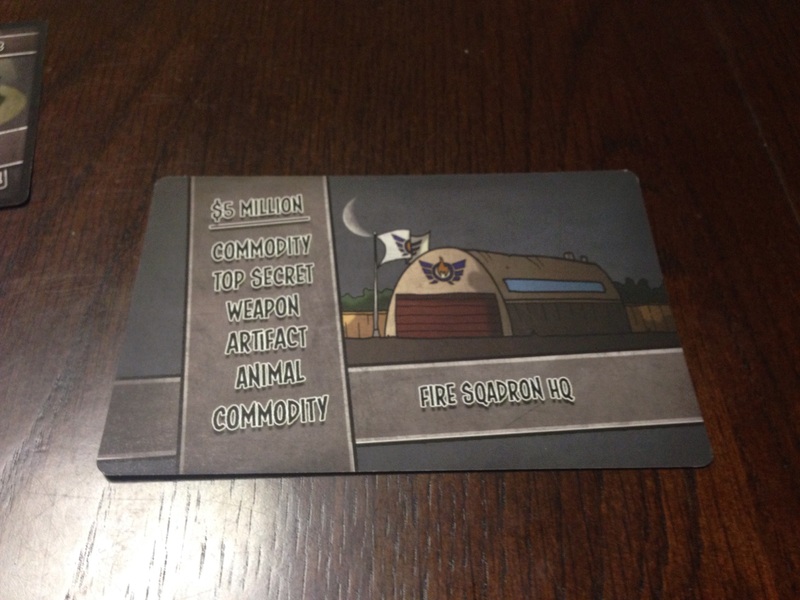 If the player has the same number of goods stored in their warehouse as the warehouse has listed, they score the warehouse and draw a new warehouse card. When a player scores a warehouse they score money equal to the combined value of all of the items stored in the warehouse in addition to the amount listed on the warehouse and then draws a new warehouse to start filling up with black market goodies. If a player manages to match all of the items they store in their warehouse to the items listed on the warehouse card, they score triple the amount listed on the warehouse card. This means that matching the listed items can pay off big, but you could be waiting around for that one commodity card you need that just never seems to jump into your hand. Also, while you are waiting to draw that one item card you need to make tons of money, your opponents can mess with your warehouse. And that brings me to “insider” cards. 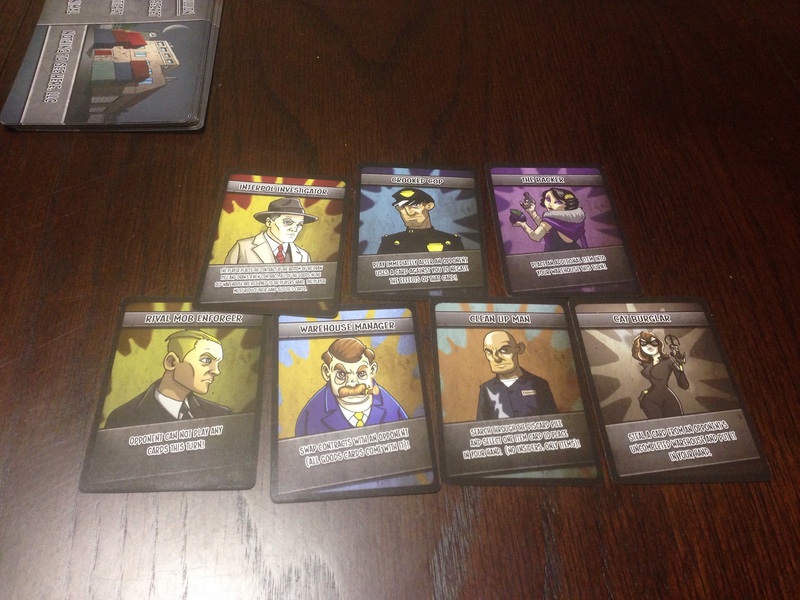 These cards are various people involved in the black market that can help you and hinder your enemies. They can allow you to store multiple items in a turn, steal items from your opponents, swap their entire warehouse with you, or call in Interpol and get rid of their warehouse. A player may only play one insider card at the start of their turn, but these can be a great way to keep your opponent from scoring a big warehouse by using the Interpol Agent the make them ditch the warehouse and put all of the items back into their hand (and then discard down to five cards!) or to force your opponent to swap that warehouse with you, including all of the items stored therein, and then finishing it off. Luckily, there are a few crooked cops on your payroll that can be played to negate the effects of another insider card. The game ends when a player fills up their warehouse and there is no new warehouse available for them to draw. This game came into existence through a successful Kickstarter, which unfortunately means his game is currently unavailable to the general public unless you know a guy. Luckily I know a guy–a friend who backed the Kickstarter for this game brought it out at our weekly game night, so I got a chance to play this great game. This game has a fun concept and the basic mechanics are very quick to learn; the complexity and skill in this game definitely start coming into play after everyone has played a few games and starts to balance the risks and benefits of going for the full match of items on a warehouse card or just trying to score a warehouse quickly with bigger ticket items that don’t match the kinds listed on the warehouse. The cards are beautifully illustrated and we all had a lot of fun seeing the various fun item and warehouse names. Hopefully Fire Squadron will be able to get all of their Kickstarter fulfillment done soon and be able to start distributing to those who weren’t able to get in on the Kickstarter; until then check out the Fire Squadron website and hope that this game will be available to the rest of us soon. 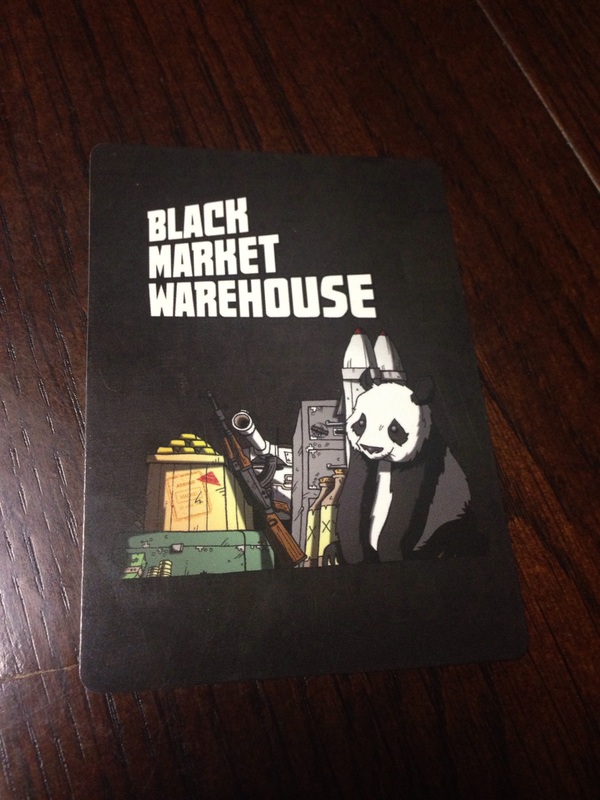 I give Black Market Warehouse 4 out of 5 stars.